Interior stain blocking matt paint, isoparaffin solvent-based, white, tension free. Properties • Excellent stain-covering (nicotine, dried water, soot, etc.) • Totally matt with no overlapping marks • Non-yellowing • Extremely easy application • Tension-free • Excellent water vapour permeability Area of application For painting new or renovated ceilings and walls. No primer or undercoat needed on dry substrates such as plaster, mortar and lime or any other chalking substrate. No preliminary washing necessary on whitewashed, stain-soiled or similar substrates (nicotine, soot, dried water, stains, etc.). 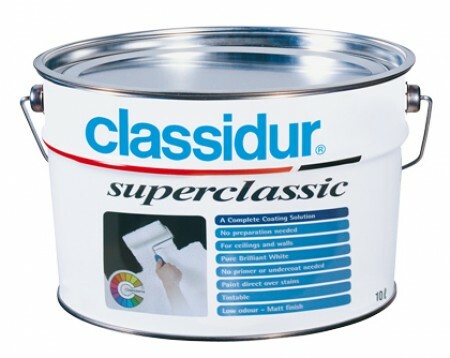 Classidur Superclassic is particularly recommended for all interior renovation work as well high quality new work.